The parades at Disney's Magic Kingdom have always been a great source of fun for us, and by evidence of the crowds, it's true for most other people visiting the park. There are three parades running at the present time, and we thought that an overview of what you could expect to see would be fun. Parade times change from day to day, so it's good to check ahead before you go to the park, or pick up a Times Guide as you enter the Magic Kingdom. 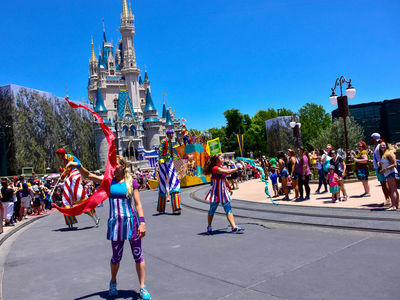 It will show you which parades are running as well as other shows and activities around the park for the day you're there. The Disney Festival of Fantasy Parade and the Main Street Electrical Parade have Fastpass tickets available if you want to secure a preferred place to view them. Pick up a Fastpass online at the My Disney Experience website, or use one of the FastPass+ Kiosks located throughout Walt Disney World. 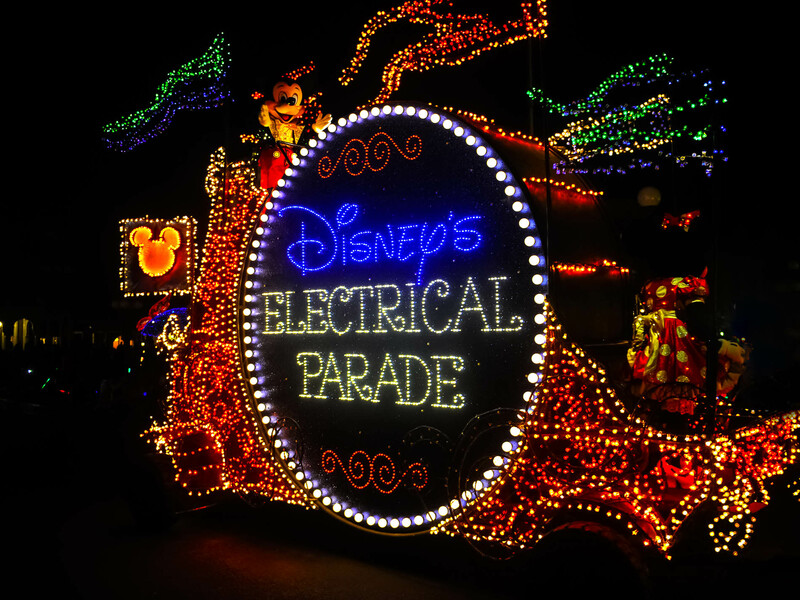 One of the oldest parades currently showing at the Magic Kingdom, Disney's Electrical Parade is also the most dazzling. It originally opened at The Magic Kingdom on June 17, 1977. It's actually had several openings throughout the years and is currently still running with no projected closing date. Photo by Donald Fink. 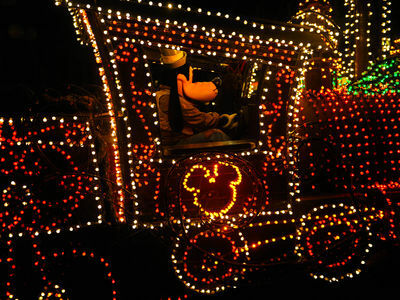 Goofy drives the locomotive Casey Junior, from the 1941 animated film "Dumbo." 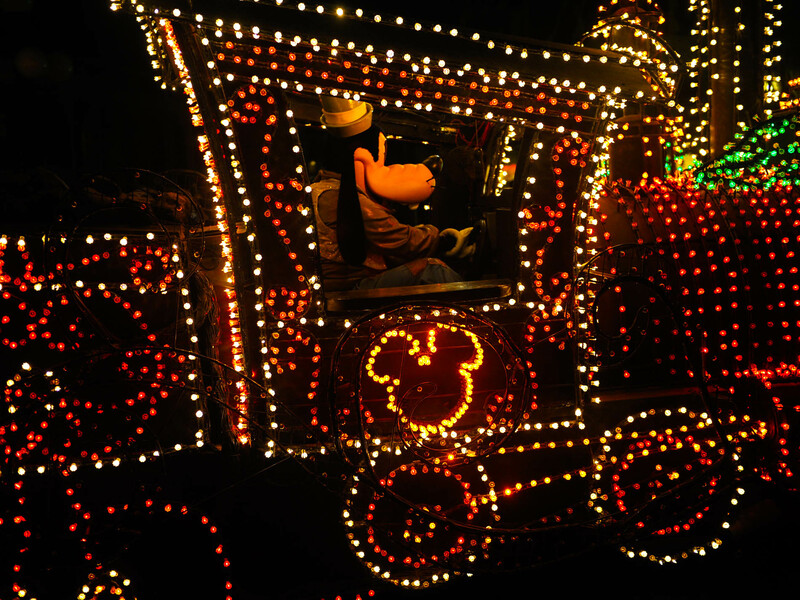 Mickey and Minnie are in cars behind. Photo by Donald Fink. Pete from the 1977 Disney film "Pete's Dragon," sits atop Elliot the Dragon. The film was a live-action production with Elliot the Dragon the only animated character. Photo by Donald Fink. From "Alice in Wonderland," the Mushroom and Butterfly have been in the parade since its beginning at the Magic Kingdom in 1977. Photo by Donald Fink. 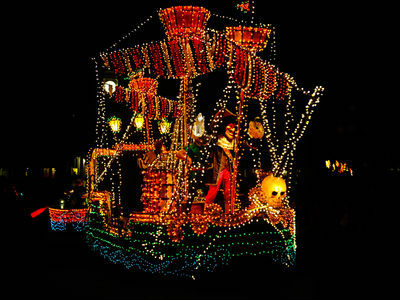 Captain Hook and Peter Pan have been sailing the Jolly Roger in Disney's Main Street Electrical Parade since 1985. Photo by Donald Fink. 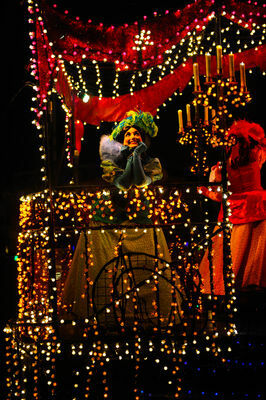 From the 1950 film "Cinderella," Drizella Tremaine and her wicked sister Anastasia ride along in the Ballroom. Photo by Donald Fink. Tinker Bell is from the 1953 film "Peter Pan." 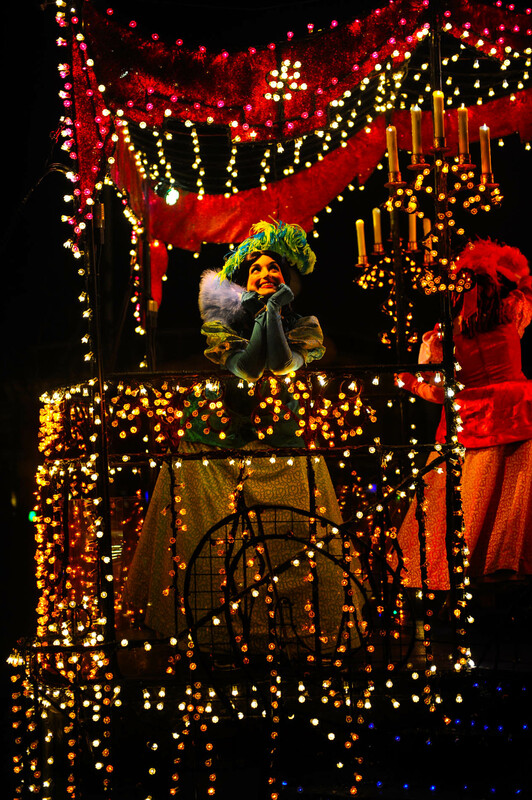 She's made many film appearances since then and even makes an appearance at the Magic Kingdom, opening the Wishes Nighttime Spectacular show at Cinderella's Castle. 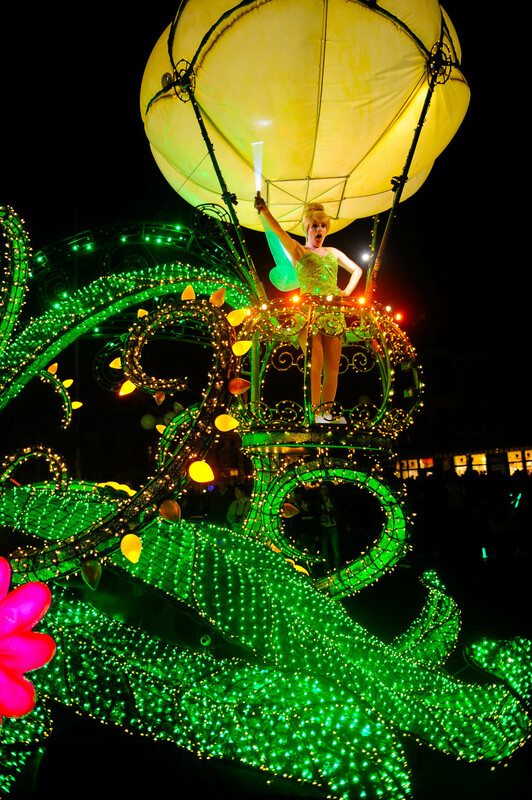 Tink joined the Main Street Electrical Parade in 2010. Photo by Donald Fink. 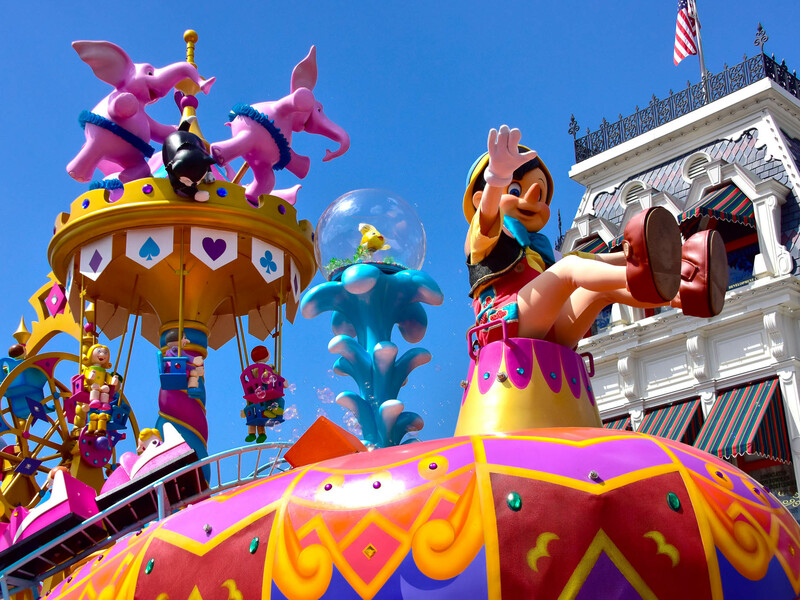 This is a relatively new parade, debuting in October, 2014. They use some of the floats from a previous parade called Move It! Shake It! Celebrate It!, but this one is more of a street party than an actual parade. 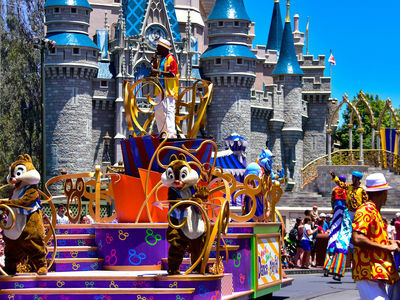 It starts near the Fire Station and makes its way up Main Street to the Central Plaza hub at the Castle. At the hub, the floats stop, and the hosts encourage guests to join the dance party in the street. They also encourage selfies during the celebration, asking that you post to Instagram and Twitter with the hashtag #MoveItShakeItPics. Some of the images are displayed on large screens located on the floats during the celebration. 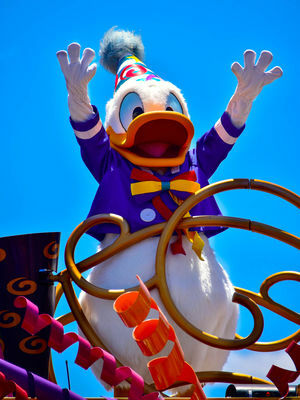 Donald Duck dances atop a float in Move It! Shake It! Dance and Play It! Street Party parade. Photo by Bonnie Fink. 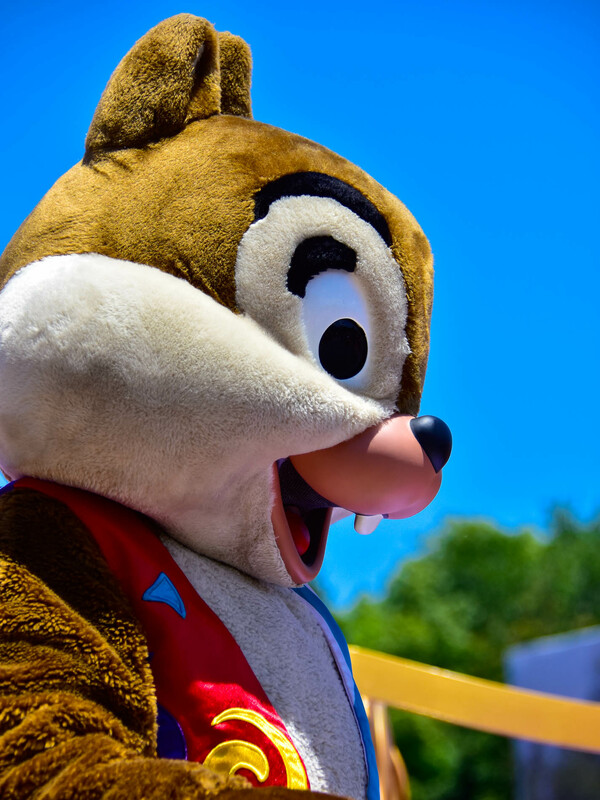 Chip 'N' Dale dance on a float at the hub during Move It! Shake IT! Dance and Play It! Street Party as a DJ encourages guests to join in the fun. Photo by Bonnie Fink. Street performers round out the entertainment at the Move It! Shake It! Dance and Play It! Street Party. 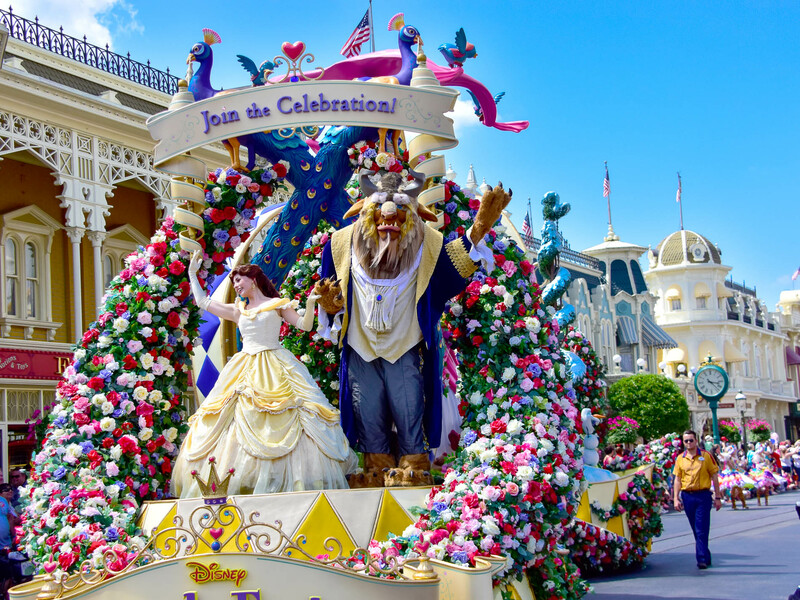 They'll entertain while the parade is in motion and they'll show you their moves when the party gets under full swing at the hub. Photo by Bonnie Fink. 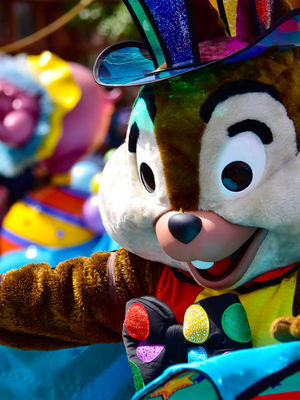 Chip dances along the side of a gift box float in Move It! Shake It! Dance and Play It! Street Party. Photo by Bonnie Fink. 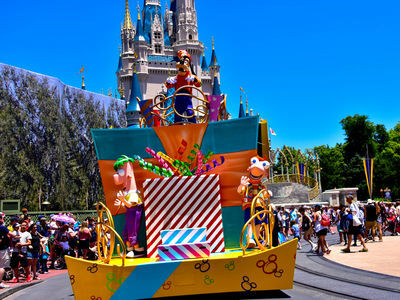 Phinneas and his English stepbrother Ferb ride a float with Goofy in Move It! Shake It! Dance and Play It! Street Party parade. Phinneas Flynn and Ferb Fletcher are characters from an animated Disney Channel series that first aired in 2008. Goofy is, well, Goofy. Photo by Bonnie Fink. 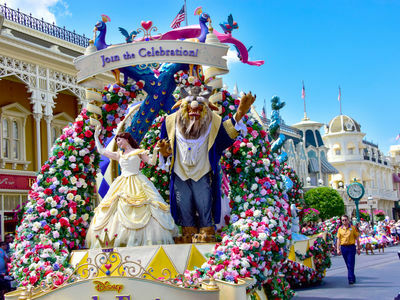 The Princess Garden Unit of the Disney Festival of Fantasy Parade leads off with Belle and the Beast from "Beauty and the Beast," followed by Cinderella, from "Cinderella," and Tiana from "The Princess and the Frog." There's even a special appearance by Anna and Else from "Frozen." Photo by Bonnie Fink. 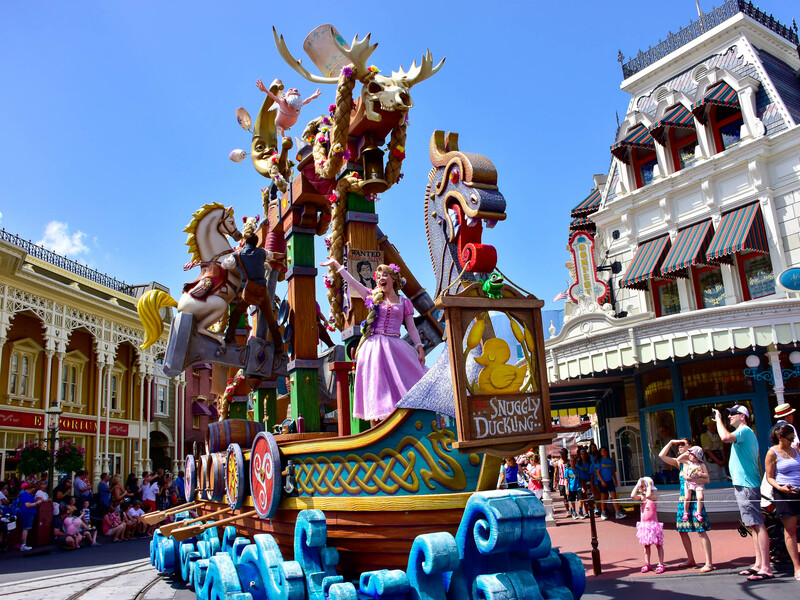 Rapunzel and Flynn Rider aboard their ship with a band of thieves, searching for another Best Day Ever! Rapunzel's hair is weaved throughout the 36 foot ship. The thieves are riding swinging pendulums. Photo by Bonnie Fink. 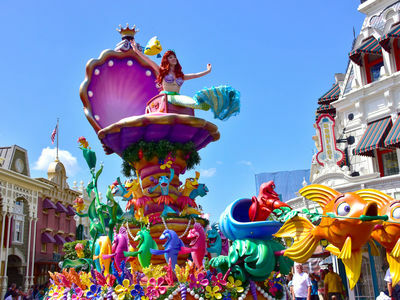 Princess Ariel, from the 1989 animated film "The Little Mermaid," sits atop a clamshell with conga-line dancing fish and crustaceans. Photo by Bonnie Fink. 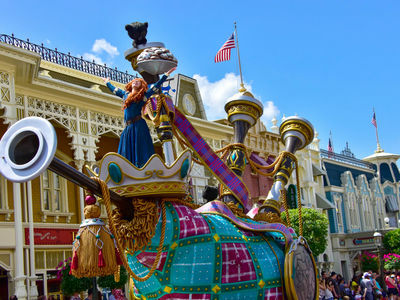 Merida, from the 2012 Disney and Pixar film "Brave" celebrates on top of a giant bagpipe. One of her little brothers, enchanted as a bear cub, looks on from above. On the ground, not pictured here, are Scottish dancers that step to music from the Great Highlands. Photo by Bonnie Fink. There's a lot to take in with this steampunk dragon that breathes fire. 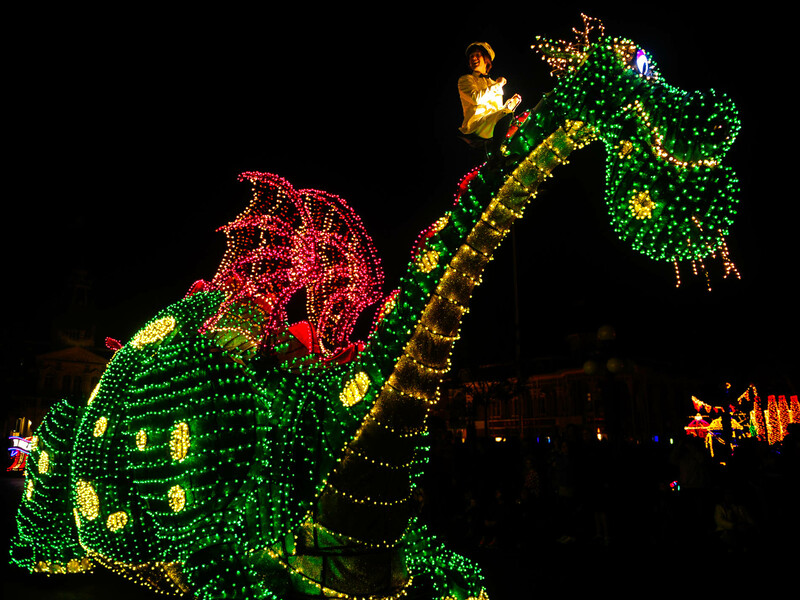 The float depicts scenes from the 1959 animated film "Sleeping Beauty" and the more recent film "Maleficent." 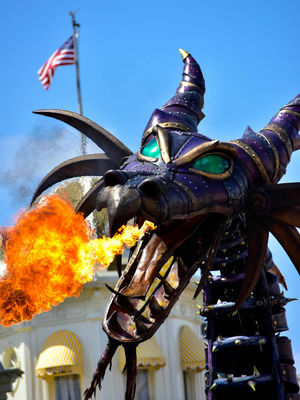 Here, Maleficent is transformed to her dragon form, breathing fire and battling Prince Phillip. 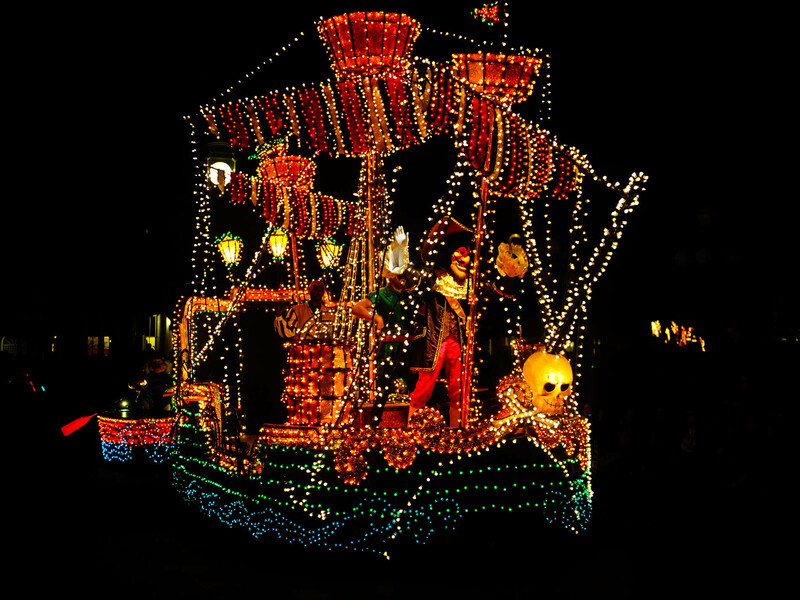 The float is 53 feet long and is the first Disney float to bend in the middle. Photo by Bonnie Fink. The finale of the parade features a 90-foot-long caravan of floats, including Pinocchio. This 1940 Disney animated film was apparently so popular that it was rereleased in 1945, 1954, 1962, 1971, 1978, 1984, and in 1992. Photo by Bonnie Fink. Chip is a busy guy. Not only does he appear in the Move It! Shake It! Dance and Play It! 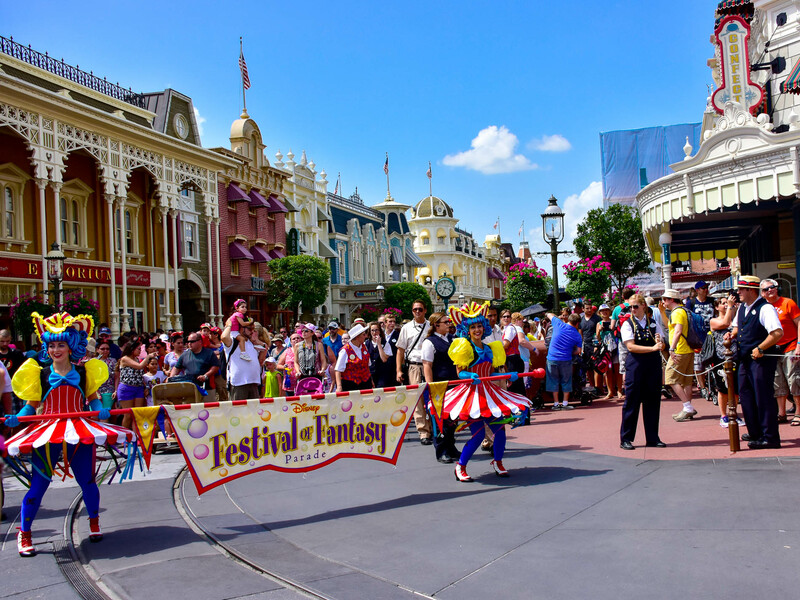 Street Party, but he has time to dance his way along the Festival of Fantasy Parade route. Photo by Bonnie Fink. 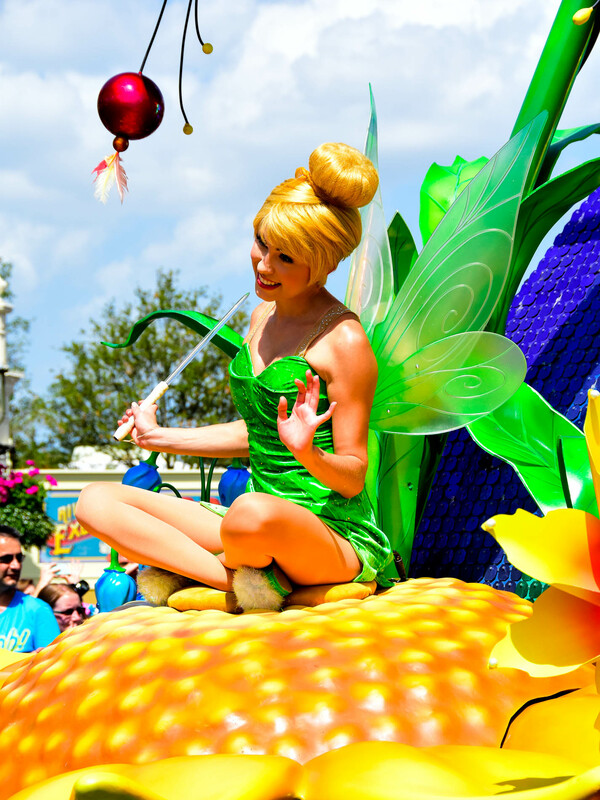 Tinker Bell is part of the Peter Pan init. 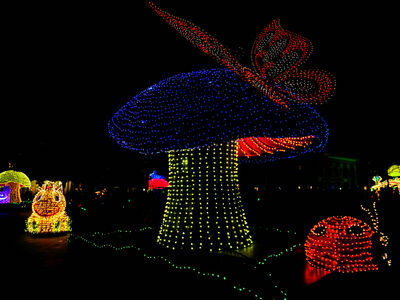 She greets guests from a magic mushroom. Photo by Donald Fink. 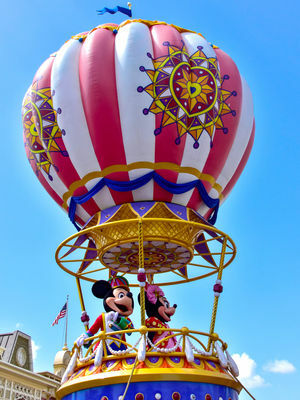 Minnie and Mickey also have time to appear in the Festival of Fantasy Parade, bringing up the rear with Mickey's Airship; a whimsical hot air balloon that follows at the end of the parade. Photo by Bonnie Fink. 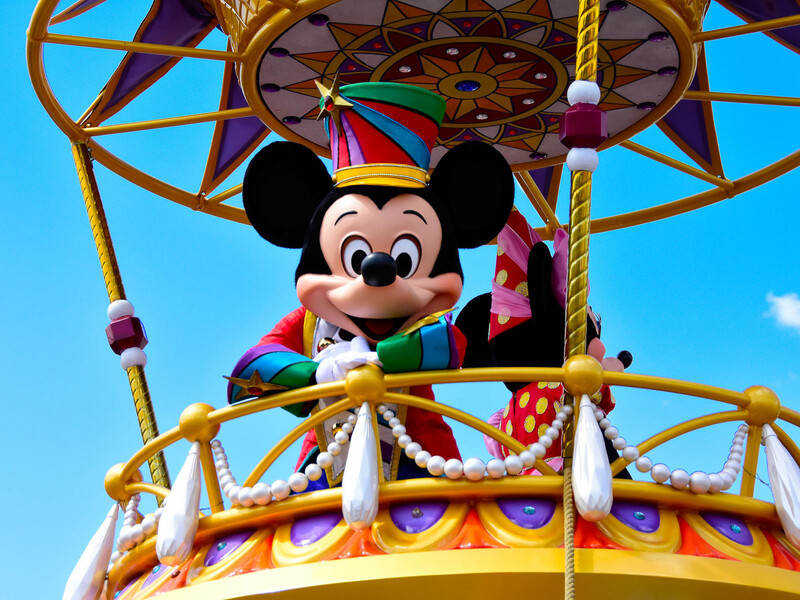 Mickey Mouse makes eye contact with guests along the parade route from the basket of his enchanted magical hot air balloon. 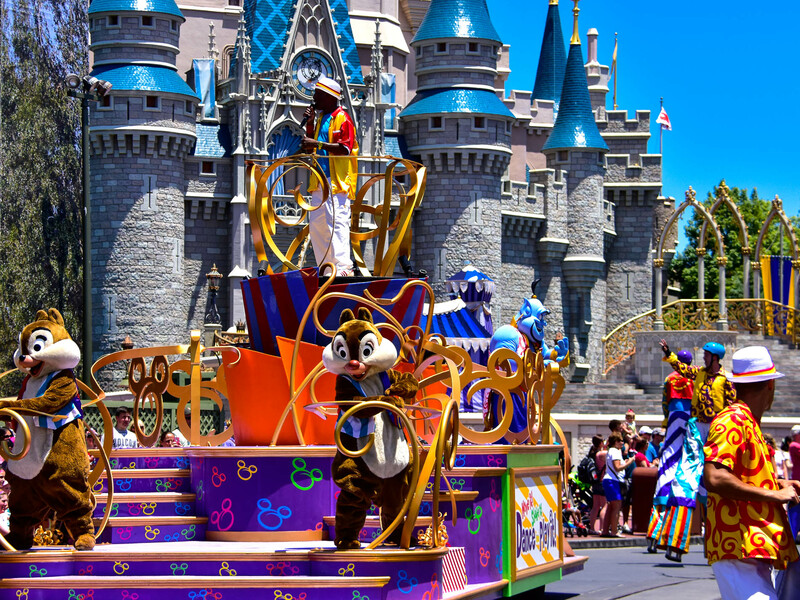 It really is amazing how personal the experience of watching a parade at Disney can be when the characters take the time to make eye contact. Photo by Donald Fink. Cinderella premiered in 1950. Sleeping Beauty was 1959, and that's the one that featured a dragon Maleficient.